Not to be confused with Paleogene. The Paleocene ( /ˈpæliəˌsiːn, ˈpæ-, -lioʊ-/  ) or Palaeocene, the "old recent", is a geological epoch that lasted from about 66 to 56 million years ago. It is the first epoch of the Paleogene Period in the modern Cenozoic Era. As with many geologic periods, the strata that define the epoch's beginning and end are well identified, but the exact ages remain uncertain. The K–Pg boundary that marks the separation between Cretaceous and Paleocene is visible in the geological record of much of the Earth by a discontinuity in the fossil fauna and high iridium levels. There is also fossil evidence of abrupt changes in flora and fauna. There is some evidence that a substantial but very short-lived climatic change may have happened in the very early decades of the Paleocene. 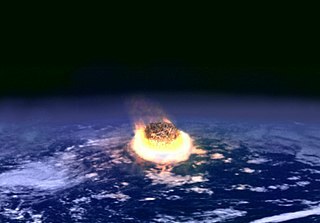 There are several theories about the cause of the K–Pg extinction event, with most evidence supporting the impact of a 10 km diameter asteroid forming the buried Chicxulub crater on the coast of Yucatan, Mexico. The end of the Paleocene (≈55.8 Ma) was also marked by a time of major change, one of the most significant periods of global change during the Cenozoic. The Paleocene–Eocene Thermal Maximum upset oceanic and atmospheric circulation and led to the extinction of numerous deep-sea benthic foraminifera and a major turnover in mammals on land. The Danian is the oldest age or lowest stage of the Paleocene epoch or series, the Paleogene period or system and the Cenozoic era or erathem. The beginning of the Danian age is at the Cretaceous–Paleogene extinction event 66 Ma. The age ended 61.6 Ma, being followed by the Selandian age. The Selandian is in the geologic timescale an age or stage in the Paleocene. It spans the time between 61.6 and59.2 Ma. It is preceded by the Danian and followed by the Thanetian. Sometimes the Paleocene is subdivided in subepochs, in which the Selandian forms the "Middle Paleocene". The Thanetian is, in the ICS Geologic timescale, the latest age or uppermost stratigraphic stage of the Paleocene Epoch or series. It spans the time between 59.2 and56 Ma. 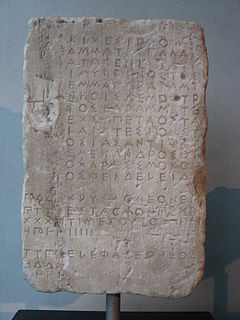 The Thanetian is preceded by the Selandian age and followed by the Ypresian age. The Thanetian is sometimes referred to as the Late Paleocene. The early Paleocene was cooler and drier than the preceding Cretaceous, though temperatures rose sharply during the Paleocene–Eocene Thermal Maximum. The climate became warm and humid worldwide towards the Eocene boundary, with subtropical vegetation growing in Greenland and Patagonia, crocodilians swimming off the coast of Greenland, and early primates evolving in the tropical palm forests of northern Wyoming. The Earth's poles were cool and temperate; North America, Europe, Australia and southern South America were warm and temperate; equatorial areas had tropical climates; and north and south of the equatorial areas, climates were hot and arid,  not dissimilar to today's global desert belts around 30 degrees northern and southern latitude. In many ways, the Paleocene continued processes that had begun during the late Cretaceous Period. During the Paleocene, the continents continued to drift toward their present positions. Supercontinent Laurasia had not yet separated into three continents - Europe and Greenland were still connected, North America and Asia were still intermittently joined by a land bridge, while Greenland and North America were beginning to separate. The Laramide orogeny of the late Cretaceous continued to uplift the Rocky Mountains in the American west, which ended in the succeeding epoch. Warm seas circulated throughout the world, including the poles. The earliest Paleocene featured a low diversity and abundance of marine life, but this trend reversed later in the epoch. Tropical conditions gave rise to abundant marine life, including coral reefs. With the demise of marine reptiles at the end of the Cretaceous, sharks became the top predators. At the end of the Cretaceous, the ammonites and many species of foraminifera became extinct. Marsupials: modern kangaroos are marsupials, characterized by giving birth to embryonic young, who crawl into the mother's pouch and suckle until they are developed. The Bolivian Pucadelphys andinus and the North American Peradectes are two Paleocene examples. Multituberculates: the only major branch of mammals to become extinct since the K–Pg boundary, this rodent-like grouping includes the Paleocene Ptilodus . Because of the climatic conditions of the Paleocene, reptiles were more widely distributed over the globe than at present. Among the sub-tropical reptiles found in North America during this epoch are champsosaurs (fully aquatic reptiles), crocodilia, soft-shelled turtles, palaeophid snakes, varanid lizards, and Protochelydra zangerli (similar to modern snapping turtles). Examples of champsosaurs of the Paleocene include Champsosaurus gigas, the largest champsosaur ever discovered. This creature was unusual among Paleocene non-squamate reptiles in that C. gigas became larger than its known Mesozoic ancestors: C. gigas is more than twice the length of the largest Cretaceous specimens (3 meters versus 1.5 meters). Another genus, Simoedosaurus , was similarly large; it appears rather suddenly in the fossil record, as its closest relatives occurred in the Early Cretaceous. Reptiles as a whole decreased in size after the K–Pg event. Champsosaurs declined towards the end of the Paleocene and became extinct during the Miocene. Wannaganosuchus , a crocodilian from the Paleocene. Examples of Paleocene crocodylians are Borealosuchus (formerly Leidyosuchus ) formidabilis, the apex predator and the largest animal of the Wannagan Creek fauna, and the alligatorid Wannaganosuchus . The Eocene Epoch, lasting from 56 to 33.9 million years ago, is a major division of the geologic timescale and the second epoch of the Paleogene Period in the Cenozoic Era. The Eocene spans the time from the end of the Paleocene Epoch to the beginning of the Oligocene Epoch. 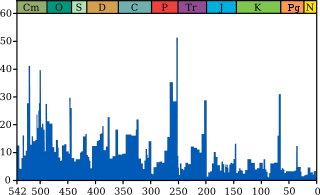 The start of the Eocene is marked by a brief period in which the concentration of the carbon isotope 13C in the atmosphere was exceptionally low in comparison with the more common isotope 12C. The end is set at a major extinction event called the Grande Coupure or the Eocene–Oligocene extinction event, which may be related to the impact of one or more large bolides in Siberia and in what is now Chesapeake Bay. As with other geologic periods, the strata that define the start and end of the epoch are well identified, though their exact dates are slightly uncertain. The Wannagan Creek site is a fossil site found just west of the South Unit of Theodore Roosevelt National Park of North Dakota, USA. The site is Paleocene in age, approximately 60 million years old. Paleontologists of the Science Museum of Minnesota have studied the site for nearly thirty years. The site is thought to represent a paleoenviroment of subtropical swampy lowland and forests. Preservation is excellent for both the flora and fauna of the site. Trace fossils of crocodilians and other vertebrates have also been discovered. Choristodera is an extinct order of semiaquatic diapsid reptiles that ranged from the Middle Jurassic, or possibly Late Triassic, to at least the early Miocene. It was named by Edward Drinker Cope in 1884. Choristoderes have been found in North America, Asia, and Europe, and possibly also North Africa and East Timor. The most common fossils are typically found from the Late Cretaceous to the lower Eocene. Cladists have placed them between basal diapsids and basal archosauromorphs, but the phylogenetic position of Choristodera is still uncertain. It has also been proposed that they represent basal lepidosauromorphs. Most recently, workers have placed Choristodera within Archosauromorpha. Seymour Island is an island in the chain of 16 major islands around the tip of the Graham Land on the Antarctic Peninsula. Graham Land is the closest part of Antarctica to South America. It lies within the section of the island chain that resides off the west side of the peninsula's northernmost tip. Within that section, it is separated from Snow Hill Island by Picnic Passage, and sits just east of the larger key, James Ross Island, and its smaller, neighboring island, Vega Island. 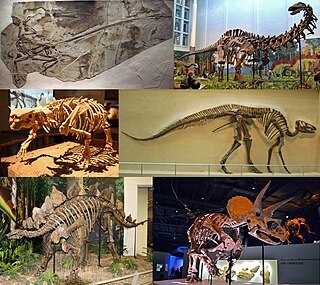 The term Paleocene dinosaurs describes families or genera of non-avian dinosaurs that may have survived the Cretaceous–Paleogene extinction event, which occurred 66 million years ago. Although almost all evidence indicated that birds are the only dinosaur group that survived past the K–Pg boundary, there is some scattered evidence that some non-avian dinosaurs lived for a short period of time during the Paleocene epoch. The evidence for Paleocene non-avian dinosaurs is rare and remains controversial, although at least one non-neornithine ornithuran, Qinornis, is known from the Paleocene. The Oulad Abdoun Basin is a phosphate sedimentary basin located in Morocco, near the city of Khouribga. It is the largest in Morocco, comprising 44% of Morocco's phosphate reserves, and at least 26.8 billion tons of phosphate. It is also known as an important site for vertebrate fossils, with deposits ranging from the Late Cretaceous (Cenomanian-Turonian) to the Eocene epoch (Ypresian), a period of about 25 million years. ↑ "ICS - Chart/Time Scale". www.stratigraphy.org. ↑ "Science Notes 2003:". Scicom.ucsc.edu. Retrieved 2012-08-28. ↑ "Paleocene Climate". PaleoMap Project . Retrieved 2012-08-28. ↑ Vajda, Vivi. "Global Disruption of Vegetation at the Cretaceous-Tertiary Boundary – A Comparison Between the Northern and Southern Hemisphere Palynological Signals". Gsa.confex.com. Retrieved 2006-07-15. ↑ Bigelow, Phillip. "The K–T boundary In The Hell Creek Formation". Scn.org. Archived from the original on 2006-07-12. Retrieved 2006-07-15. ↑ Kazlev, M. Alan (2002) "The Paleocene". Palaeos Cenozoic. Retrieved April 3, 2013. ↑ Musser, A. M. (2003). "Review of the monotreme fossil record and comparison of palaeontological and molecular data". Comparative Biochemistry and Physiology A. 136: 927–942. doi:10.1016/s1095-6433(03)00275-7 . Retrieved April 3, 2013. ↑ Rage, Jean-Claude; Métais, Grégoire; Bartolini, Annachiara; Brohi, Imdad A.; Lashari, Rafiq A.; Marivaux, Laurent; Merle, Didier; Solangi, Sarfraz H. (2014). "First report of the giant snake Gigantophis (Madtsoiidae) from the Paleocene of Pakistan: Paleobiogeographic implications". Geobios. 47 (3): 147–153. doi:10.1016/j.geobios.2014.03.004. Ogg, Jim (June 2004). "Overview of Global Boundary Stratotype Sections and Points (GSSP's)". Stratigraphy.org. Retrieved December 22, 2008. Wikimedia Commons has media related to Paleocene . John Alroy, "Evidence of a Paleocene Evolutionary Radiation"